Hi everyone! As you probably guessed, store I’ve been a bit busy with our new addition. Olivia Camero Ainslie made her debut on Saturday, sales June 18th at 10:29 PM. She was 6 lbs 5 oz., 19 inches long and cute as a button! Here she is at 2 weeks old (cue the awwwww). Thank you all for your well-wishes! This creamed corn is much lighter than the traditional version, and oh my was it good! The corn was sweet and summery and a little creamy. Cherry tomatoes, lime zest and fresh basil add just the right amount of brightness. It was a most perfect summer side dish and made our otherwise boring lunch (sandwich, of course) something special. Now that things have settled into more of a pattern, I’m looking forward to blogging at least once a week. Wish me luck! Remove the kernels from the corn cob. Simply recipes has a great method here. Set a large skillet over medium heat. Once it’s hot, melt the butter then add the corn, tomatoes and salt. Cook for about 15 minutes, or until the corn is tender and the tomatoes are melted. Add the half and half and lime zest and cook for an additional 5 minutes. Remove from heat and stir in the extra tablespoon of half and half. Place in a serving bowl and sprinkle with the chopped basil. Makes 4 side servings (2 if you’re really hungry). Congrats on the arrival of your daughter. The corn dish looks yummy. Welcome Olivia!!! She is so cute, I love the pose :-). The corn dish looks nice too, corn is one of my favs, especially in the summer. I make something very similar with corn but never added tomato though. This looks so colorful! Ð¯ Ð½Ðµ Ñ€Ð°Ð´, Ñ‡Ñ‚Ð¾ Ð¿Ð¾Ð¿Ð°Ð» Ð½Ð° ÑÑ‚Ð¾Ñ‚ ÑÐ°Ð¹Ñ‚( Ð”Ð¸Ð·Ð°Ð¹Ð½ – Ð¾Ñ‚ÑÑ‚Ð¾Ð¹, Ñ„ÑƒÐ½ÐºÑ†Ð¸Ð¾Ð½Ð°Ð»Ð° – Ð½Ð¸ÐºÐ°ÐºÐ¾Ð³Ð¾, Ð°ÐºÑ‚Ð¸Ð²Ð½Ð¾ÑÑ‚ÑŒ – Ð¼Ð¸Ð½Ð¸Ð¼Ð°Ð»ÑŒÐ½Ð°Ñ. ÐŸÐ¾Ñ‡ÐµÐ¼Ñƒ Ð±Ñ‹ Ð²Ð°Ð¼ Ð½Ðµ Ð·Ð°ÐºÑ€Ñ‹Ñ‚ÑŒÑÑ? Ð£Ð¶ Ð¸Ð·Ð²Ð¸Ð½Ð¸Ñ‚Ðµ Ð·Ð° ÐºÑ€Ð¸Ñ‚Ð¸ÐºÑƒ.. Ð½Ð¾ ÑÑ‚Ð¾ Ñ‚Ð°Ðº. I’ve been following your site for a few months now, and I’m happy to see you’re back. I send you, Tom and Olivia the very best wishes for many days of happiness together. Congratulations! Congrats on the baby, she is beautiful! 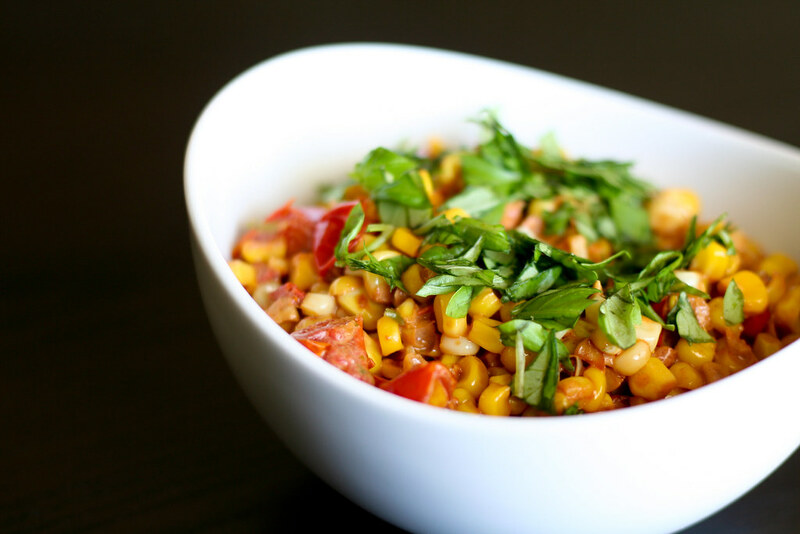 I LOVE summer corn, great recipe! Congrats! Olivia is adorable! And this creamed corn looks delicious! Welcome to the world Olivia! You are a real cutie. Congratulations!! I haven’t been on here in a while and I love reading you had a baby!! Nice job!! She’s beautiful and what a beautiful name! Congrats…..it seemed like that went fast! Enjoy your time as a new mama! I share my middle name with my mother so I love that you girls do too!!! Special! I am just catching up on blogs and see how late I am with Congratulations !! A beautiful name for a beautiful baby girl, wishing you all the best forever ! A lovely little girl! Congratulations! Girls are so special-I have three. The corn looks great, too! Yum! Loving the last of the summer corn right now!